Hi everyone! In this post I’ll go over the standard accessories that are needed to play the game of air hockey (pucks, paddles, etc.) Before I get into that, I would also like to say that I have a review of another set of paddles and pucks that you can be interested in as well. The main differences are that the paddles of a different shape compared to what I’m going to cover here. Also, another difference is that there more paddles and pucks of different sizes (adult and kids sizes). Introducing the Home Standard Air Hockey Paddles and 2 Size Pucks by Qtimal. I found this on Amazon, and if you like the standard playing style of air hockey, then this is for you. 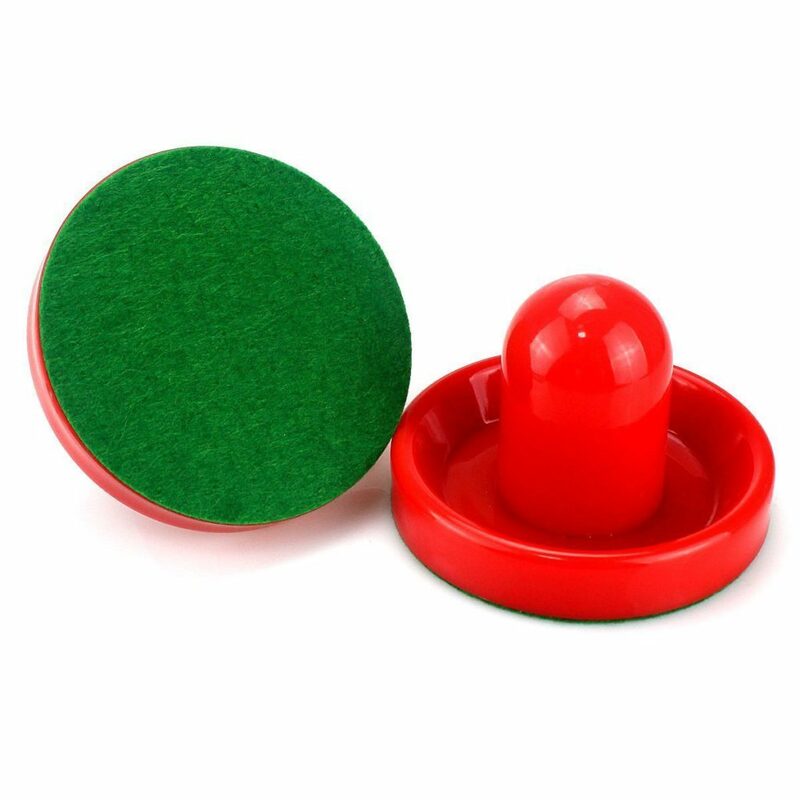 If you have ever lost your air hockey pucks in the heat of the game. That would be nothing worse. Why not have some spares on hand when the next time this happens? 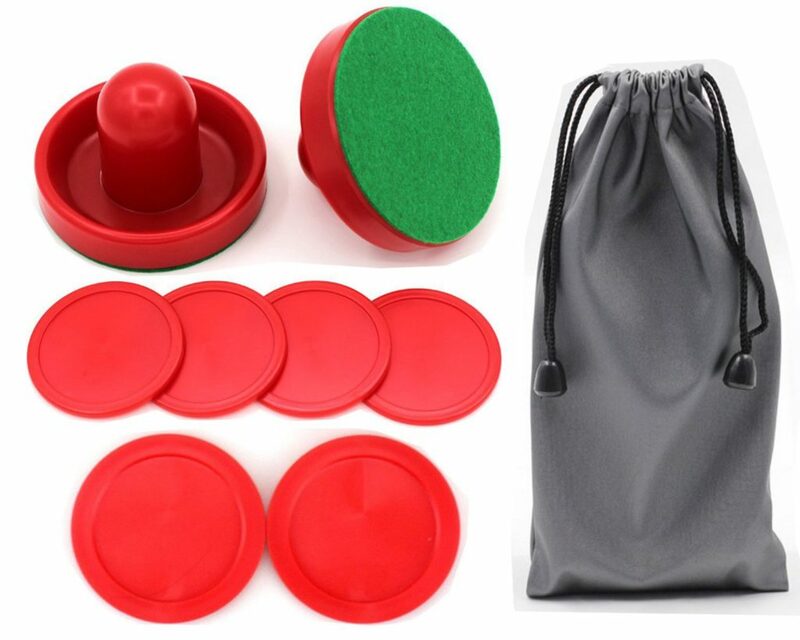 This pack of 6 pucks & 2 sliders are perfect for replacing any old worn out or lost air hockey equipment! There are 2 different size for most people. 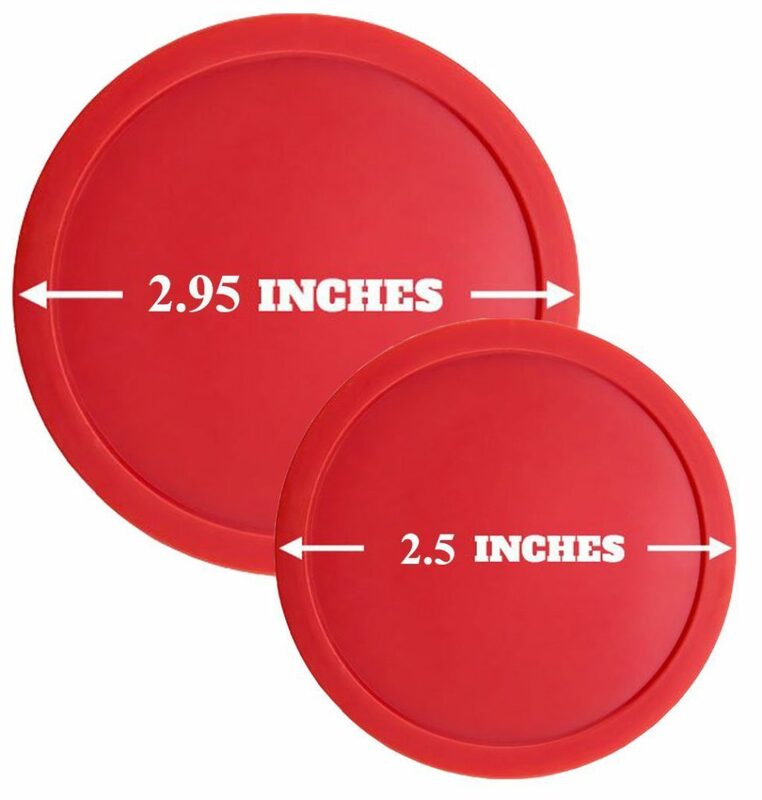 Small Size (2.5″ inches in diameter) for Kids, Large Size (2.95″ inches in diameter) for Adult. They are a perfect make for arcade style tables, for bars with billiards, and perfect to have in video game rooms or man caves. 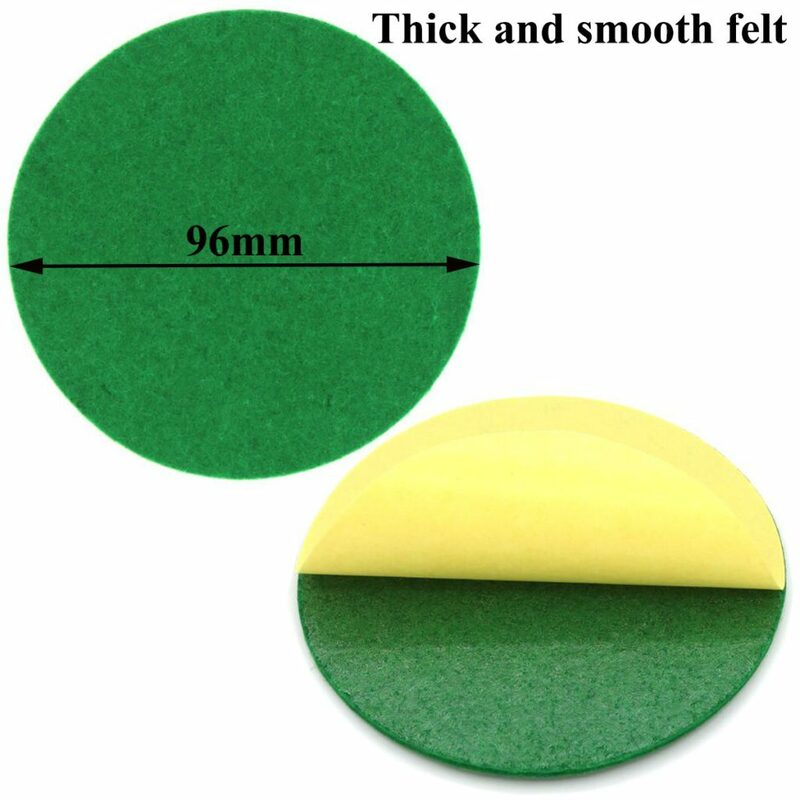 The striker felt bottom provides a fast easy gliding action while protecting the table top surface. This set is sure to bring that fast action new table feel to your competitive games. The strikers provide a comfortable feel and enhance the overall game experience even during vigorous table play. Take your air hockey game to the next level. 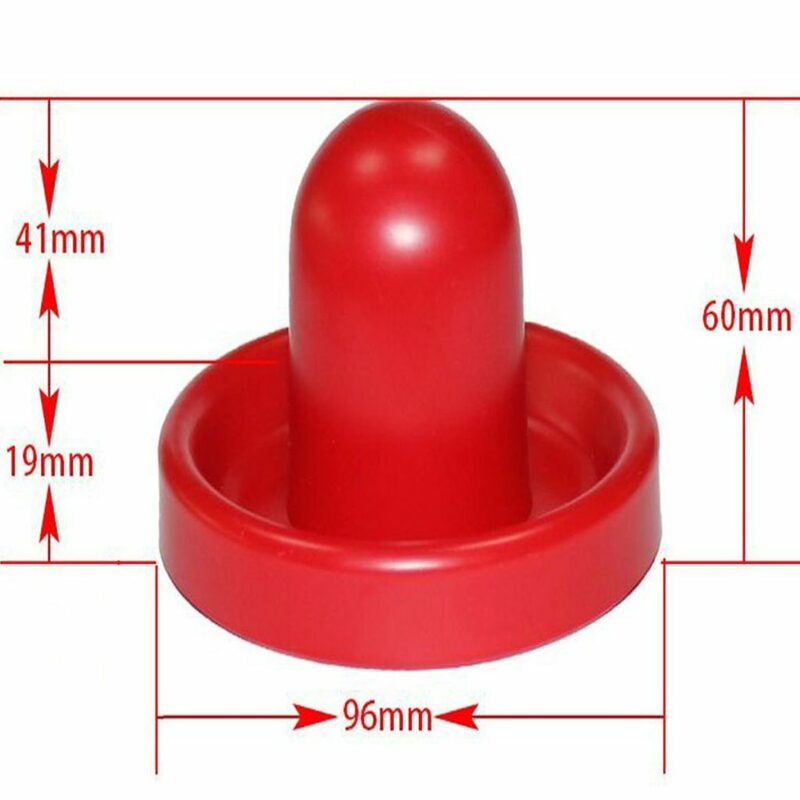 Please note that the size of the pusher is not suitable for mini air hockey table. It has a potential to be a choking hazard, make sure your little kids play under supervision. I would like to add that this set is best used for a standard hockey table. So, I don’t recommend to use this on a table top air hockey table as it is not designed to be played on that. Amazon has a reputation to have great customer satisfaction. If you are unsatisfied with it for whatever reason, you may return it for a full refund within 30 days of receiving it. Always make sure to keep the receipt as proof of payment. I hope that you liked reading this post and found it to be informative. If you did, please share on social media. Also, add any thoughts that you may have in the comments box below. I thank you for stopping by, and look forward to seeing you again in the next post. Cheers!